Like all children, refugee children have the fundamental right to development, survival and life. However, living in exile, refugee children are all too often denied normal childhoods. Refugee children in Malaysia are denied access to education and can only enrol in special ‘community learning centres’. These are often underfunded and rarely monitored. Whilst the status of refugees in this country is widely debated, surely everyone can agree that a child - no matter where they are from - should be protected, cared for and be given the best opportunity to thrive in life? This is where Destiny Welfare Centre comes in. Destiny is one such community learning centre that provides education and care to refugee children. The women who runs the centre - Irene J Dawson gave up her job in a multinational company and tirelessly dedicates her life to these underprivileged children. What started as a morning day care for some 15 children has now grown into a school for over 80 underprivileged kids. Destiny Welfare Centre provides English classes, freshly cooked healthy meals, showers, and parental support and counselling. This growth is not down to marketing, but by word of mouth. The amazing work Irene and her team are doing is spreading through the refugee community and is encouraging parents to put their kids in school. Local playgrounds now see Bangladeshi and Pakistani children communicating with each other in English. Not only has the kids English improved, Irene and her team have seen a massive improvement in their health. For the first time these poor children are now receiving daily hygienic care and are being fed and taught about the importance of fresh food, fruit and vegetables. The change in their physical appearance has also been remarkable. This is what makes destiny stand out from other refugee learning centres. It’s not only a school where they can improve mentally, but physically and socially aswell. The enormous impact their efforts have made in the community cannot be stressed enough. There are currently over 20 underprivileged children on the waiting-list with even more expected to sign up. Destiny Welfare Center would love to take on as many little children as possible, but space and funds restrict them. That is why Destiny are planning to build 4 new classrooms next to their existing preschool. They need your help to achieve this! Each classroom will cost roughly RM 7500 to build and furnish. Our target is therefore RM 30 000. Please give all you can to help fund this wonderful cause - every ringgit counts! The 3 classrooms will allow Irene and her team to reach all the children currently on the waiting list plus many more. The space will allow more deserved children to experience the amazing opportunity Destiny provides. The lives of the 80 children who Irene looks after at Destiny have undoubtedly changed for the better. Through empowerment, nourishment and education, these children are now healthier, smarter and better equipped to thrive in life. 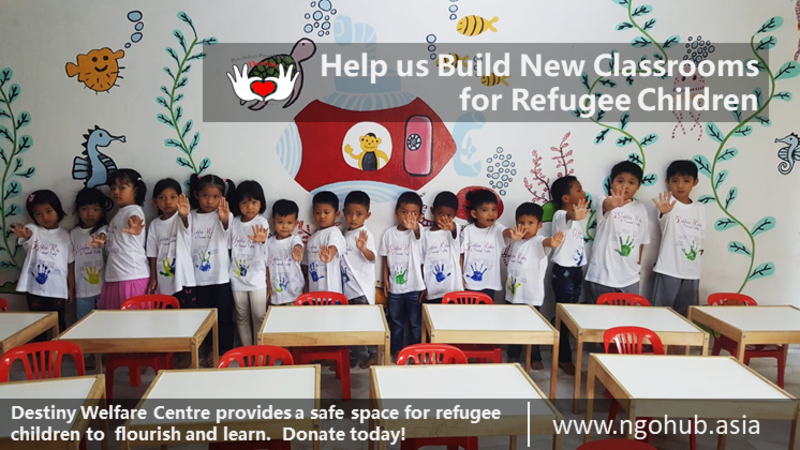 Donate now to provide a safe space for refugee children to flourish and learn - give them the opportunity of a better life - a life that they truly deserve. Help raise even more funds for this campaign by setting up your own fundraising page. Simply click ‘Fundraise’, fill in your details to create your very own page, and share this page with your friends and family encouraging them to donate to this worthy cause. Alongside this campaign, NGOhub have organised a BUNGEE JUMP. Why not take part, challenge yourself and have your friends and family sponsor you to push yourself to the limit? THIS IS A ONCE IN A LIFETIME EXPERIENCE.- so don’t miss out, places are filling up fast! The Jump itself takes place on the 8th December. Raised of MYR 15,000.00 target.